Dorothy Huston proved it's never too late to graduate. However, the 93-year-old northeast Ohio woman was more surprised than anyone when she received an Akron North High School diploma on Wednesday afternoon. 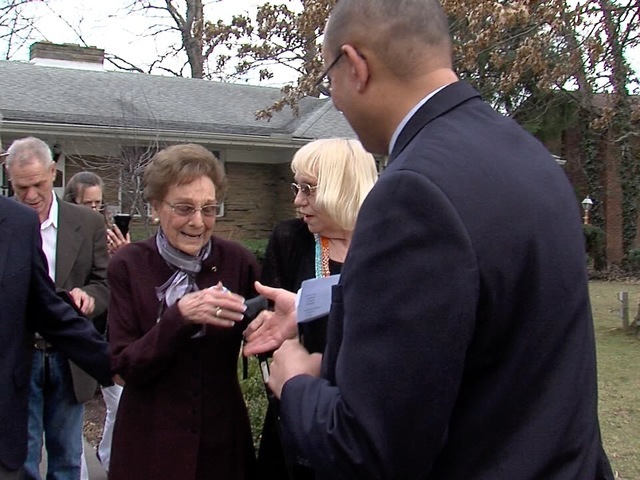 Akron Public Schools Superintendent David James presented the diploma on the senior citizen's birthday-- 74 years after she should have graduated. "This is the most wonderful gift I've ever had," she said. The touching ceremony brought Dorothy and many family members to tears outside of her Fairlawn, Ohio home. Dorothy's daughter, Janice Larkin, wrote a letter to the district explaining that her mother was just a few weeks from graduating in 1942 when the school learned she was married and expelled her. Larkin wrote that no amount of pleading by Dorothy's parents could convince the school to change the decision. According to Larkin, Dorothy's fiancee at that time, John Huston, graduated from North two years earlier and was called to serve in the U.S. Army Air Corps. The couple ran away to Kentucky to get married and discovered a few months later that Dorothy was pregnant. The plan was for Dorothy to join John after she finished school. However, after a North gym teacher embarrassed Dorothy one day, she ran to the locker room and blurted out she was married and didn't have to be treated this way. Larkin doesn't believe the school knew Dorothy was also pregnant. "In those days, if you were married you couldn't go to school," Larkin told newnet5.com. "She regretted it her whole life. She would always say to us, 'I didn't even get a GED. I didn't get a chance to get my diploma,'" said another daughter, Diane Bailey. "She still deeply regrets never completing high school and uses it as a lesson for those she mentors. I believe that my mother deserves to receive her high school diploma and it would be a wonderful accomplishment for her," Larkin wrote in her letter to the district. The couple eventually had five children and Dorothy mentors grandchildren, great grandchildren and neighborhood kids. She has also read a biography on every U.S. President and their wives.